About Dr. David W. Dickerson: Dr. David W. Dickerson has served Peachtree Baptist Church as senior pastor for thirty-nine years. He holds four earned degrees, which include the Doctor of Ministry and Doctor of Education. He has served on the Board of Directors of Global Baptist Mission, Asheville, NC for thirty years. 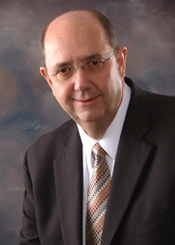 He led Peachtree Baptist Church in the establishing of educational ministries, which include Peachtree Baptist Academy, Georgia Baptist College and Theological Seminary. Pastor David, as he is affectionately called, preaches frequently in Conferences for Revival, Bible Conferences, and Missions Conferences throughout the eastern United States and many foreign countries. His love for foreign missions has opened many doors for him over seas. His most recent accomplishment has been in assisting the Mediterranean Baptist Mission with the establishing of the Middle East Baptist Seminary in Alexandria, Egypt. This ministry is an extension of Georgia Baptist College and Theological Seminary. Pastor David has a great burden for revival and a return to our historical Baptist distinctives, the gospel of grace and God exalting music and worship in our churches. He has built the ministries of Peachtree Baptist Church upon solid Biblical truth by expository preaching of God’s Word.